The city of Badajoz sits in the wide valley of the Guadiana with high mountains approximately 100Km away to the north south and east. These mountains mostly rise to a height of 800m, with those to the north east rising to 1400m. The weather station at Badajoz is situated at 185m above sea level, with the Atlantic coast approximately 175Km to the west and south. Winter temperatures will be roughly equivalent to the north coast of Spain, significantly lower than the south coast, with mid summer temperatures being similar to the Mediterranean coast. 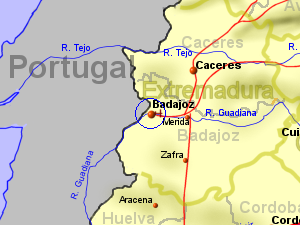 The average rainfall for Badajoz is 475mm or 18.5 inches (Source: World Climate), with very little rainfall during July and August.